Acclaimed Irish violinist Anna Cashell and British concert pianist Simon Watterton have appeared all over the world both as soloists and duo partners. Join them on a journey of musical discovery, from Bach to Gershwin and beyond. 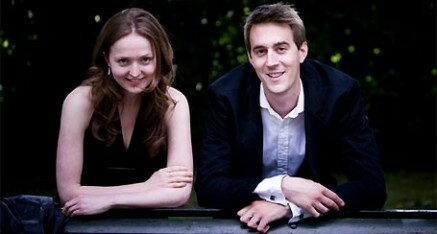 Anna and Simon met as students at the Royal College of Music. They recently formed as a duo and now play concerts across the UK and further afield. Recently they have performed in Sweden, Spain, Northern Ireland and Beijing, where they gave a performance in the Forbidden City Concert Hall. Anna – who hails from Balbriggan, Ireland – won the most prestigious award at the Royal College of Music, the Tagore Gold Medal. Since then she has made a career as soloist and chamber musician. In addition to playing with Simon, she co-founded the Schumann Quartet and also gives many performances of contemporary music. She is a member of the Irish Chamber Orchestra and currently lives in London. Simon was recently featured as a ‘Rising Star’ in the International Quarterly Piano magazine. He has performed extensively and recently gave concerts at the Banff Centre in Canada. In 2009 he completed a cycle of all of the Beethoven piano sonatas in London. He was born on Wirral in the UK, and currently lives in London.